A weekend dance acro offering with two infinitely gifted acrobats, dancers and performers. They will offer a days’ intro and a days’ intermediate to advance dance acro on the 5th and 6th March 2016. 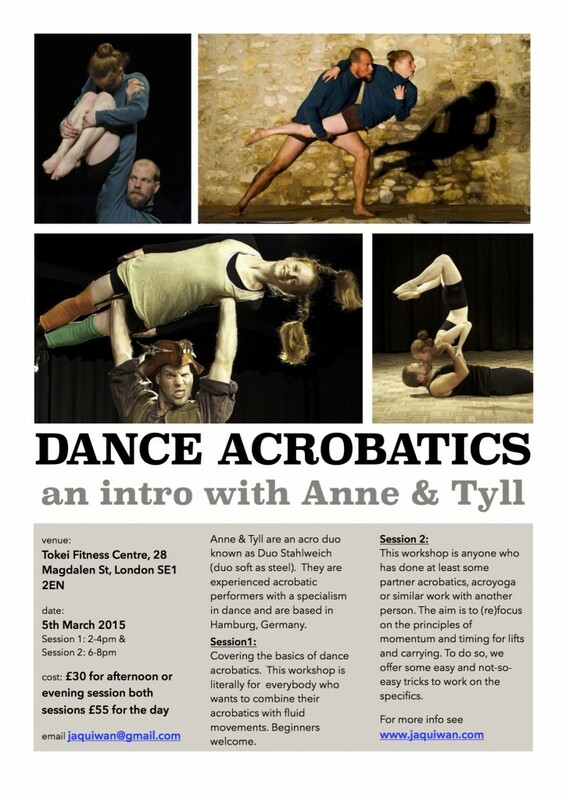 Join Anne Zimmerman & Tyll Wibben a dance acro duo forming Duo Stahlweich (Duo Soft-as-Steel) in their weekend workshop offering in March 2016. The workshop will cover a variety of ways on going in and out of acro-balance postures, with a specific focus on dance and movement. They will cover different difficulty levels throughout the weekend and some experience in partner acrobatics would be an advantage. Anne and Tyll will encourage all you acrobats to playfully research your own knowledge base and with the material covered, explore careful guided sequences and transitions. Finished her studies at the “Stage School of Music Dance and Drama“ in 2004. She worked as a dancer at the West Side Story and as an acrobat in the Eventteam of Jochen Schweizer (Vertical Ballet). The fundamentals of danceacrobatics were taught to her by Sean Cronin in Las Vegas. Outside acrobatics Anne works as a phychologist. Graduated as ‘Tanzpadagoge’ (Teacher of Dance) in 2009 at the Lola Rogge Schule in Hamburg. He led his own Dancestudio and works as a freelancer for Prof. F. Böhme at the University (Hochschule für Musik und Theater; HfMT). For bookings please use the paypal payment buttons below. If you do not have a paypal account BACS transfers can be made if you send me an email. 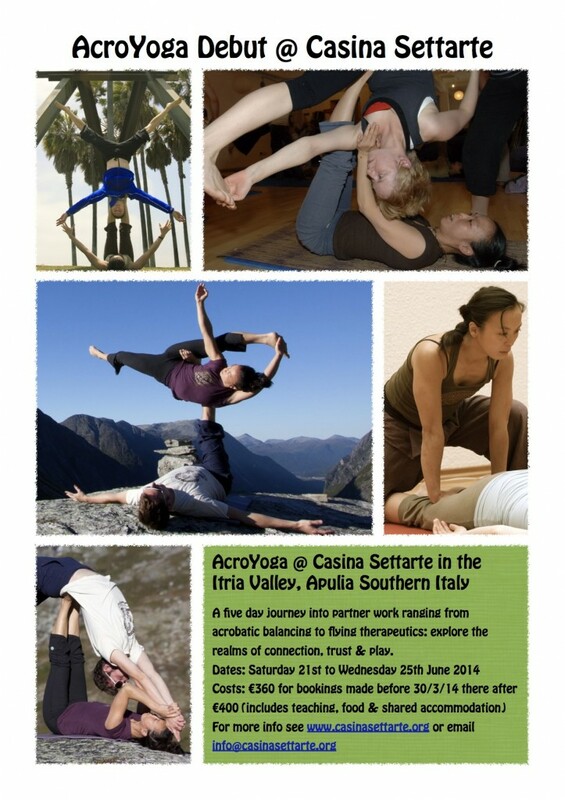 A first for Casina Settarte, we have the pleasure of the offering to you an AcroYoga Debut. AcroYoga brings together the ancient disciplines of yoga, healing arts and acrobatics into the one umbrella practice. We are offering you a five day debut into this wide ranging and abundantly creative practice. the principles of Thai massage. This five day debut is aimed as an immersed introduction into the practice of AcroYoga. No experience or no partner necessary, you will be supported! Do come with an open mind & a willingness to have fun! Tap into your source of strength, flexibility and creative will. We will explore the qualities of acrobatics beginning with conditioning & strength exercises working on the embodiment of inversions, headstands, forearm balances and handstands. We will work progressively in small groups on static balances to sequences; involving a base, flyer and spotter with some focus on transitions. We require you have willingness to explore your fearless inner child. This aims to be a bodywork extravaganza. We will introduce you to the art of healing touch and work with ‘Metta’ loving kindness a real treat for our often tired and over worked bodies. We will practice the principles of mutual support, giving and receiving and introduce you to a blend of Thai massage sequences and therapeutic flying flows blended with massage. Come with an open heart! We recommend all participants have some regular form of yoga asana or physical body practice, are comfortable with inversions (assisted headstands or handstands against a wall) and are prepared to work with a partner or in small groups. Please note participants will be required to arrive on the 20th June and depart first thing on the 26th June. Cost: Whole weekend £95 (£75 concessions) £60 day rate. These rates are valid if booked on or before 2nd March 2013 there after the whole weekend will increase to £110 (concessions £95), day rate remains at £60. Join Anne Zimmerman & Tyll Wibben a dance acro duo forming Duo Stahlweich (Duo Soft-as-Steel) in their weekend workshop offering in March 2013. For bookings contact jaquiwan@gmail.com or use the link below, concession payments are made separately also if you do not have a paypal account BACS transfers can be made if you send me an email.